Your schedule is our schedule! We are always glad to design a completely custom trip anywhere in Maine that has enough water to float the Laughing Gull. We know the entire Maine coast, the estuaries and the big lakes of her interior. Are you a photographer who likes working with the low angle light at either end of the day? We’ll get you there at the right time. Are you an avid birder that finds birding best at dawn? Would you like to see bird nesting islands, seals hauled out on ledges or wading birds feeding on a tidal flat? We will help you plan your trip for the right tide. Are you fascinated by the dramatic architecture and rich history of Maine's light houses? One built in 1791 was the first in the nation after independence. Another was commissioned by George Washington. Remember they were built to be viewed from the water! Maine loves to celebrate her history and culture with festivals and special events. We can build such events as Windjammer Days or Lobster Boat races into your trip or even make them the main focus. We're also pleased to offer boat transport services to professionals needing access to islands or remote shore lines for scientific purposes or to entertain guests, clients or supporters. Laughing Gull has sliding cockpit roof and windowed curtains can be quickly deployed to provide cozy shelter should our trip encounter a little rain. An enclosed marine head (toilet) provides comfort and privacy. We know Maine's coast, estuaries and inland lakes and can help you design the perfect trip. Call us to discuss your ideas and needs. Welcome cruise ship visitors! Captain Steve enjoyed 4 seasons as wilderness fishing guide in Ketchikan Alaska working exclusively with cruise ship visitors. 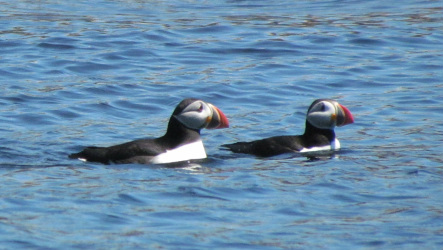 We know that cruise ship passengers get to see a lot of open water and are interested in up close exploration of picturesque lobstering harbors, secluded coves full of birds and the winding back channels around the lovely islands along Maine’s coast. We show you the beauty, nature, and history of Maine’s hidden coast and yes we’re really “from around here". Captain Steve will get you back to your ship on time. In his 4 Alaska seasons none of his guests ever missed a boarding call. We can put together inn to inn multi day trips ( limit 6 guests) Please call 207-462-2747 or email: lgboatcharters@gmail.com to start planning your trip.